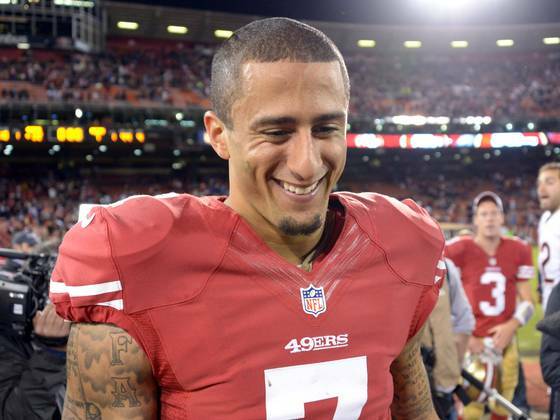 Cardboard Sports: Is Colin Kaepernick Overrated? Colin Kaepernick is, supposedly, the 81st best player in the NFL. Sure, this comes just after throwing for 1,800 yards in half a season, and a 100+ QB Rating in the playoffs, but is he really better than guys like Percy Harvin and Jimmy Graham? Or even RG3 like many claim he is. I say play a full season and put up those numbers, and you're good. But for now it's pretty obvious to anyone with eyes that guys like Robert Griffin and Russell Wilson are better quarterbacks than Kaepernick. It's one thing to step in and do well for a team like the 49ers, and it's another thing to make a team like the Redskins and Seahawks good.